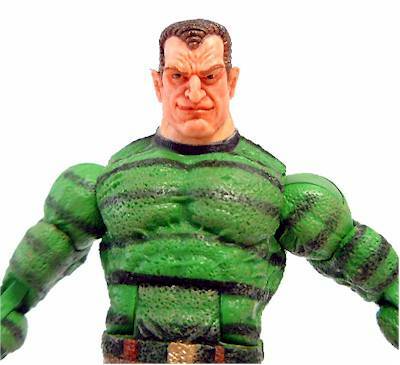 Toy Biz released a Sinister Six Boxset last year under the "Marvel Legends" header. While it was a good idea, the response towards it was lukewarm. It's understandable, because the quality of some figures in the set was abysmal. More importantly, however, the characters in the set were not the Sinister Six that the fans were craving for. 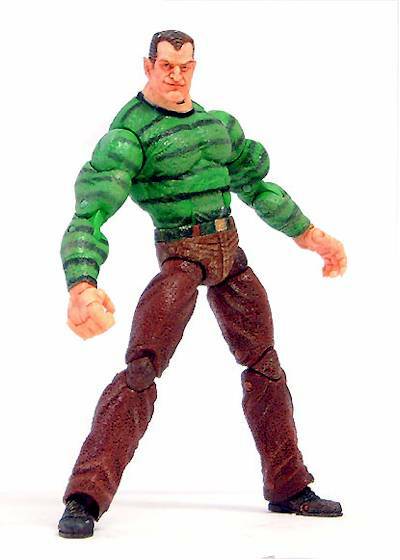 Enter the Sandman from the Spider-Man line. I bought this figure loose, so I don’t have a shot of the package. However, if you’ve been following the line closely, you’d know that the packaging uses the traditional bubble-on-card approach. I thought this makes figures looks kind of cheap, but it also means that Toy Biz can keep the price point at an affordable level. As usual, this is not a major issue for me, since I’m not a MOC-er. 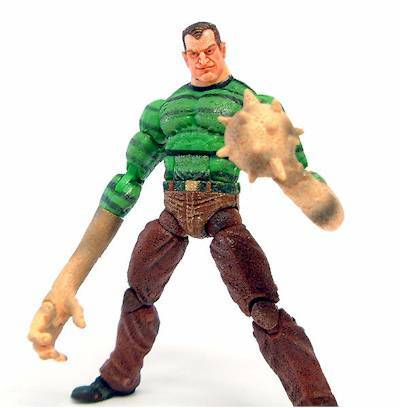 The sculpt of Sandman is quite good. It doesn't really hide the articulation points, but through the years, I've grown to accept that this is the best that Toy Biz could do given the amount of movement their toys have. The face sculpt is, well, pretty sinister. In a sense, it fits the character well. The elaborated biceps, however, continue to bother me. You may notice in one of the pictures above that the biceps look very unnatural, even from a rather frontal angle. 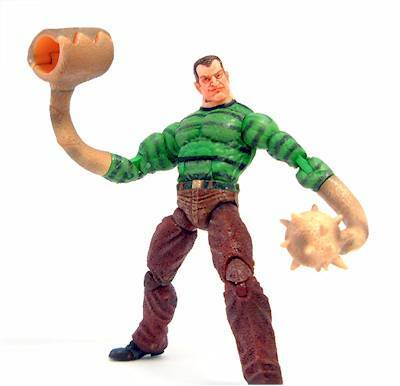 Surely, someone in Toy Biz has a thing for these bulging muscles. The paint work is pretty consistent. There is minimal bleeding, and the lines are generally clean and defined. I particularly like the sandy effect on his t-shirt, which is a nice touch that adds something to the character. I also like the design of the t-shirt, even though some may argue that it looks identical to a certain big, round fruit commonly known as the water-melon. 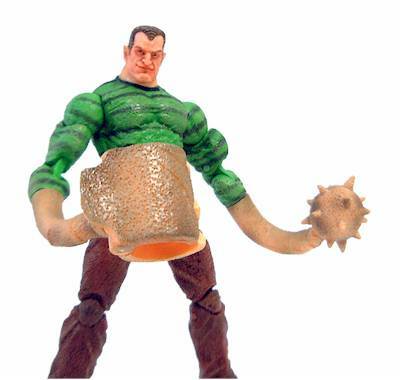 The Sandman is a typical Toy Biz figure of recent years. With over 30 points of articulation, the figure provides plenty of posing possibilities. The strong knees and ankles joints also mean that the figure stands up pretty well on his own, even when you pose him in more dynamic stances. Some of his accessories, however, may cause him to topple, due to additional weight on the upper body. The accessories are all nicely sculpted and painted. The sheer amount of them also means that you can have a decent number of permutations on how you want him to look like. The elongated right hand and clamp also have articulation points, even though the one on the clamp is more of a spring-loaded devise. If you’re looking for a fun toy with good articulation and a selection of extras, this will be it. 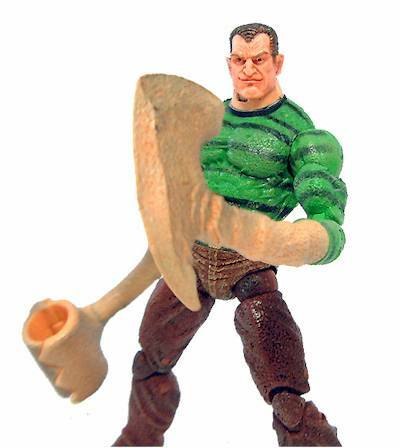 The Sandman provides the sort of playability that would please most kids. Including me, even though I’ll be 30 this coming September. 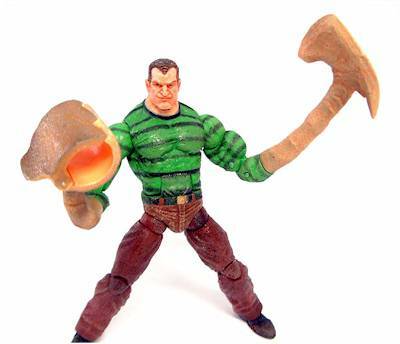 Sandman is quite the business if you can find him at retail. At $7.99, you get a great figure, plus a lot of envious stares. Otherwise, subtract one to two stars off this, depending on how much you pay for him from the scalpers. In conclusion, the Sandman is a great toy. He has a reasonable sculpt and a good paint work. He also has great articulation and an impressive array of accessories. The fact that he's a member of the Sinister Six puts the icing on the cake. Figure from the collection of Lestor Wong.